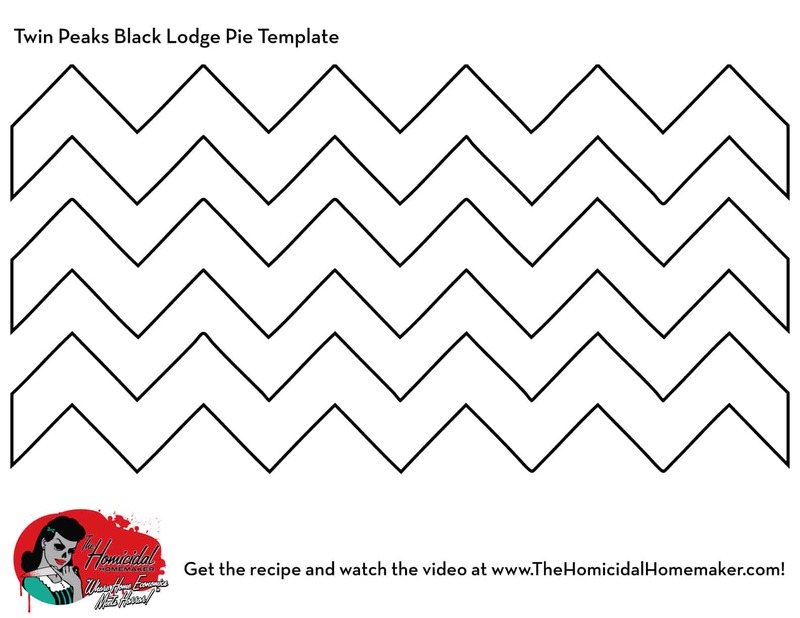 Twin Peaks Black Lodge Pie Recipe for #TwinPeaksDay! Every day, once a day, give yourself a present. 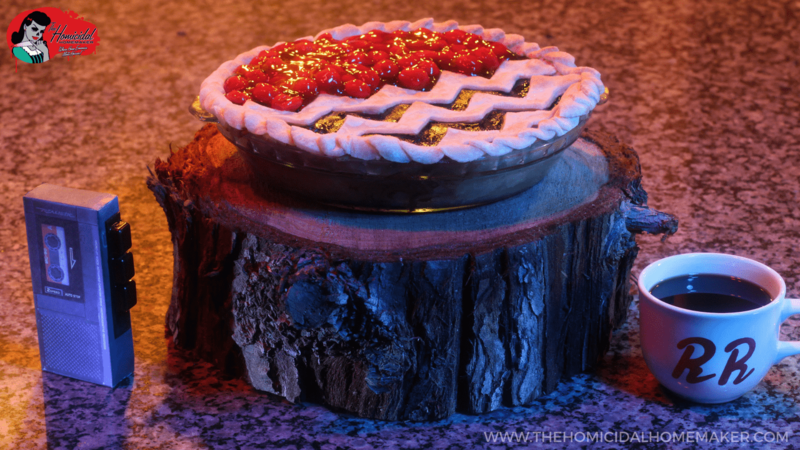 Like this decadent Twin Peaks Black Lodge Pie! Happy #TwinPeaksDay! Pour yourself a damn fine (and hot!) cup of coffee, and sit down with a slice of this decadent Twin Peaks Black Lodge Pie. With a buttery crust, rich chocolate filling, and tart cherries…this pie is really something! 05/17/17 UPDATE: I have posted a NEW episode with 3 recipes for your Twin Peaks party! Jerry Horne’s Smoked “Cheeseball” Pig, the Horne brothers’ Brie-&-Butter Baguettes with Cherry Pie Chutney, and the Leland Palmer Cocktail! All of these appetizers go perfect with my Twin Peaks Black Lodge Pie! Check it out here. Pre-heat your oven to 350° F. While your oven is pre-heating, prepare your pie crust. Cover a 9″ pie dish with crust. If you prefer your crust on the thicker side, you’ll need to pre-bake it with some pie weights for about 10 minutes, but if you’re using a thinner or store-bought crust, there is no need to pre-bake the crust beforehand. Place onto a sturdy baking sheet (this makes removing from the oven much easier), and set aside. On a cutting board, or other flat surface, roll out the remainder of your pie crust. Make sure that the diameter is slightly wider than your pie dish. Print and cut out the provided template. Using a sharp knife and the template as a guide, cut out chevron-shaped strips. Then place in the freezer (this hardens the butter/shortening, and helps the strips to retain their shape when we move them to the top of the pie). In a saucepan over medium-low heat, combine the sugar, cocoa, flour, and milk. Stir until smooth. Add the softened butter, and continue to stir until the mixture is smooth. Pour approximately 1/4 of the hot chocolate mixture into the beaten eggs, and quickly stir (this is called tempering, and makes it so you don’t end up with scrambled eggs in your pie!). Then pour the egg mixture into the saucepan. Stirring constantly, cook over medium-low heat for about 2 minutes, until thickened. Remove the pan from heat, and stir in your vanilla extract and half of the cherry pie filling. Pour the filling into your pie shell. Remove the chevron strips from the freezer, and place on top of the pie. Use aluminum foil or a pie-shield so your crust doesn’t burn, and bake at 350° F for 25 minutes. After 25 minutes, remove the foil/pie shield and allow the crust to brown for another 10 minutes. Once the center of your pie is set, but still shiny, remove from oven. If the pie doesn’t seem set after 35 minutes, continue to bake, checking on it in 5 minute increments, until set. Remove from oven, and allow to cool to room temperature, then chill in the refrigerator for 1-2 hours, or until ready to serve. When ready to serve, spoon the remainder of your cherry pie filling to the top half of the pie, to resemble the red curtains of The Black Lodge. Slice it up, serve, and enjoy! To make this already super-decadent pie even tastier, serve with whipped cream and additional cherries. For vegan variation: use 1 T of cornstarch + 3 T of water for each egg in the recipe, or, use your favorite egg-replacer (Ener-G, or aquafaba are popular choices). Use a vegan butter substitute, such as Earth Balance, in place of the butter, and your favorite non-dairy milk in place of the milk (I prefer almond, coconut, or a blend of the two). Use a vegetable shortening based pie-crust, or your favorite vegan-friendly recipe. If you enjoyed my recipe for my Twin Peaks Black Lodge Pie, I’d appreciate it if you’d share it with your friends and family on social media. Be sure to check out my YouTube channel for episodes of my horror cooking show, tutorials, cocktails and much more! And if you created something using this tutorial, don’t forget to tag me on Twitter or Instagram & use the hashtag #HomicidalHomemaker for a chance to be featured! Previous articleLearn How to Make Edible Entrails on my NEW Horror Cooking Show!